In the fall of 1937 and on into 1938 … and 1939 … and even 1940, an Alabama couple found themselves locked in a dispute in the Sumter County, Alabama, Circuit Court. But that’s not what captured The Legal Genealogist‘s attention as much as one document filed by the complainant-wife in response to an amended answer filed by the defendant-husband. 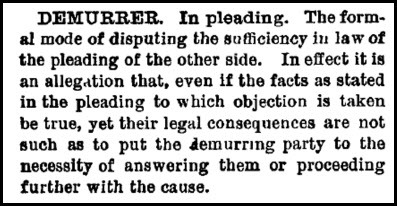 The formal mode of disputing the sufficiency in law of the pleading of the other side. In effect it is an allegation that, even if the facts as stated in the pleading to which objection is taken be true, yet their legal consequences are not such as to put the demurring party to the necessity of answering them or proceeding further with the cause. So our complainant-wife here was saying that the defendant-husband’s answer was long-winded and raised a bunch of issues that weren’t to the point and couldn’t all be raised in this one case. None of which really mattered in the end. So an answer that did not contain equity would be one that failed to establish that the defendant-husband was entitled to the relief he was asking for.